In his article “Athiesm’s Big Night in Little Rock,” (The Morning News, April 27, 2007), John Brummett stated: I’d asked Skip Rutherford, dean of the Clinton School, if he expected trouble — a shouting demonstration from zealous religious believers, perhaps. “Could be,” he said. Much of the criticism against religion revolves around violence. We do live in a violent world, and religion has often been the reason (or at least the justification) for violent acts. But the New Atheists are kidding themselves if they think that a world without religion would usher in a utopia where there is no longer violence, oppression, or injustice. Sean McDowell and Jonathan Morrow point out in their book on the New Atheists that details matter when you are examining religion. Injustices by the Taliban in Afghanistan ought not to be used as part of the cumulative cases against religion in general or Christianity in particular. The fact that there are Muslim terrorists in the world today does not mean that all Muslims are dangerous. And it certainly doesn’t mean that Christianity is dangerous. The New Atheists, however, still want to contend that religion is dangerous while refusing to accept that atheism has been a major reason for death and destruction. If you were to merely look at body count, the three atheistic regimes of the twentieth century (Hitler in Nazi Germany, Stalin in Russia, and Mao in China) are responsible for more than 100 million deaths. Religion is not the problem; people are the problem. And removing religion and God from a society doesn’t make it less dangerous. The greatest death toll in history took place in the last century in atheistic societies. Ronald Reagan and Virginia Mayo in the 1952 film She’s Working her Way Through College. Reagan cared a lot putting in across the board tax cuts and he talks about his plans during the 1980 Republican National Convention. This tax cut brought about a huge boast to our economy. Ronald Reagan roasts George Burns. Ronald Reagan plays with his daughter Patti in the pool of their Pacific Palisades, Calif., home in 1966. Basically the USA will be where PIIGGS is today. Portugal, Ireland, Italy, Greece, Great Britain, and Spain are guilty of following down the path of socialism that we are going down. The only difference is that we are about 10 years behind them. Similar results can be expected in the USA that they have now. This forecast of José Piñera was given in 2003. Second, Proponents of Social Security privatization can cite examples of other countries all over the world privatizing their social security systems and can report much success. Australia began to implement personal accounts back in the mid-1980s, and the results have been remarkable. The government’s finances are stronger. National saving has increased. But most important, people now can look forward to a safer and more secure retirement. Another great example is Chile, which set up personal accounts in the early 1980s. This interview with Jose Pinera, who designed the Chilean system, is a great summary of why personal accounts are necessary. All told, about 30 nations around the world have set up some form of personal accounts. Even Sweden, which the left usually wants to mimic, has partially privatized its Social Security system. 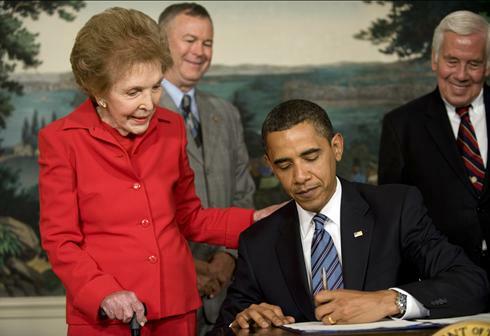 President Obama signs the Ronald Reagan Centennial Commission Act on June 2, 2009, as former first lady Nancy Reagan looks on. I am going to include in my series on Ronald Wilson Reagan a group of articles from USA Today that deal with today’s politicians and what they appreciated about Reagan. By Barack Obama in USA Today. Ronald Wilson Reagan was a believer. As a husband, a father, an entertainer, a governor and a president, he recognized that each of us has the power — as individuals and as a nation — to shape our own destiny. He had faith in the American promise; in the importance of reaffirming values like hard work and personal responsibility; and in his own unique ability to inspire others to greatness. President Reagan recognized the American people’s hunger for accountability and change — putting our nation on a bold new path toward both. And although he knew that conflicts between parties and political adversaries were inevitable, he also knew that they would never be strong enough to break the ties that bind us together. He understood that while we may see the world differently and hold different opinions about what’s best for our country, the fact remains that we are all patriots who put the welfare of our fellow citizens above all else. It was a philosophy that President Reagan took to heart — famously saying that he and Democratic Speaker Tip O’Neill, with whom he sparred constantly, could be friends after 6 o’clock. It’s what led him to compromise on issues as contentious as Social Security and tax cuts. And it’s what allowed him to work with leaders of all political persuasions to advance the cause of freedom, democracy and security around the world, including reducing nuclear weapons and imagining a world, ultimately, without nuclear weapons. But perhaps even more important than any single accomplishment was the sense of confidence and optimism President Reagan never failed to communicate to the American people. It was a spirit that transcended the most heated political arguments, and one that called each of us to believe that tomorrow will be better than today. At a time when our nation was going through an extremely difficult period, with economic hardship at home and very real threats beyond our borders, it was this positive outlook, this sense of pride, that the American people needed more than anything. When the future looked darkest and the way ahead seemed uncertain, President Reagan understood both the hardships we faced and the hopes we held for the future. He understood that it is always “Morning in America.” That was his gift, and we remain forever grateful. Frank Sinatra, Dean Martin, then California Gov. 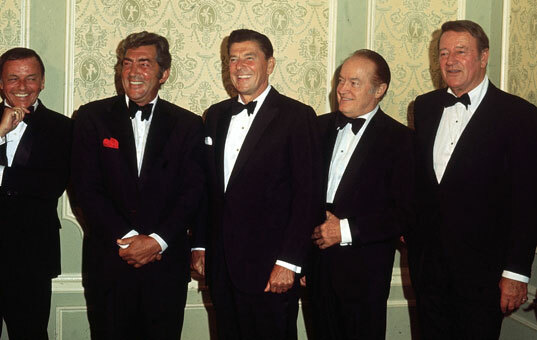 Ronald Reagan, Bob Hope and John Wayne attend a party to benefit Reagan’s gubernatorial campaign in 1970. Its the Master of Venom’s turn to dish out the punishment, this time its Govenor Ronald Reagan. Violence has been Nicaragua’s most important export to the world. President Reagan and Nancy Reagan wave from a limousine during the Inaugural Parade on Jan. 20, 1981, in Washington. This was the warmest Inauguration Day on record, hitting 55 degrees. Secret Service agents react after President Reagan is shot as he exits a side doorway of the Washington Hilton on March 30, 1981. A great moment in modern conservatism. 1980 Republican National Convention speech by Ronald Reagan. President Reagan and Justice Sandra Day O’Connor walk outside the Supreme Court after O’Connor was sworn in Sept. 25, 1981. O’Connor was the first woman on the Supreme Court. Ronald Wilson Reagan was born on Feb 6, 1911. I wanted to celebrate his life the next couple of weeks with some great posts about him. Today I am starting off with some funny quotes from him. “I hope you’re all Republicans.” -speaking to surgeons as he entered the operating room following a 1981 assassination attempt. President Reagan and Queen Elizabeth II pose for photographers at a formal state dinner at the M.H. de Young Museum in San Francisco’s Golden Gate Park. At left are Prince Philip and first lady Nancy Reagan. George Bush discusses his plans to privatize Social Security. Personal accounts are safer than the current system. Notice that neither political party proposes letting people opt out of Social Security, which exposes the lie that your contributions are set aside and saved. After all, if your contributions are really set aside for your retirement, the money is there earning interest, right? If your money is in your account, what difference would it make if your neighbor chooses not to participate in the program? The truth of course is that your contributions are not put aside. Social Security is a simple tax. Like all taxes, the money collected is spent immediately as general revenue to fund the federal government. But no administration will admit that Social Security is nothing more than an accounting ledger with no money. You will collect benefits only if future tax revenues remain high. The money you paid into the system is long gone. My hope is that at least some members of the new Congress will cut through the distortions to see Social Security as it really is. The best way to fix the impending Social Security crisis is also the simplest: Allow younger individuals to opt out of the program and use their tax savings to invest privately as they see fit. This is the true private solution. Your money has never been safe in the government’s hands and it never will be. Source: Author’s calculations based on figures in Social Security Administration, Social Security Bulletin, Annual Statistical Supplement, 1994 (Washington: Government Printing Office, 1994); Stocks, Bonds, Bills and Inflation (Chicago: Ibbotson Associates, 1995); and “IFC Investible Index,” International Finance Corporation, Washington, 1995. Don’t forget to join us this Thursday evening for our “Paint the Town Red: Jeans, Boots & BBQ” celebration to honor our newly elected officials! The event begins at 6:30 p.m. at the Robinson Center Exhibit Hall in downtown Little Rock. Tickets are $50 per person, children 12 & under are free. We’ll have a barbecue buffet provided by Whole Hog, live country music, and an auction for a Henry Rifle. Conservative news radio host Dave Elswick will serve as the night’s master of ceremonies. I am looking forward to visiting with Republican State lawmakers tonight. I have in the past put in profiles of most of these fine Republicans. (I have actually done 50 so far.) Take a look at some of them below. Jake Files of Ft Smith. But millions of Americans now realize that the status quo is an illusion that will not last even another 10 or 20 years. The federal government cannot continue to spend a trillion dollars more than it collects in revenue each year because we are running out of creditors. Fiscal reality is setting in and the consequences may be grim, even if Congress finds the courage to take decisive action now. Courage begins with a commitment to see things as they are, rather than how we wish they were. When it comes to Social Security we must understand that the system does not represent an old age pension, an insurance program or even a forced savings program. It simply represents an enormous transfer of payment with younger workers paying taxes to benefit the other beneficiaries. There is no Social Security trust fund and you don’t have an account. Whether you win or lose the Social Security lottery is a function of when you happen to be born and how long you live to collect benefits. Of course young people today have every reason to believe they will never collect those benefits. Social Security is a bad deal for young workers today and they are voicing their opinions. What do you think of the nation’s Social Security system? Do you think that by the time you retire there will be enough money in the system to pay you the benefits you are entitled to, or do you think there will not be enough money left to pay you benefits? Source: A Washington Post-ABC News poll conducted by telephone January 12 – 16, 2005 among 1,007 randomly selected adults nationwide. Margin of sampling error for overall results is plus or minus three percentage points. Fieldwork by TNS of Horsham, PA.
Another idea to help keep the Social Security system funded would let workers put some of their Social Security savings into stocks or bonds if they wanted to. That could produce higher or lower benefits depending on how the investments perform. Would you support or oppose this stock-market option for Social Security?